The 10th Judicial District Commission on Judicial Performance unanimously recommends that Judge Valerie Villanueva Haynes NOT BE RETAINED. 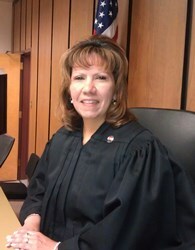 Judge Haynes was appointed to the bench of the Pueblo County Court on June 28, 2011. Prior to her appointment, Judge Haynes served as a Deputy District Attorney in the 13th, 4th and 10th Judicial Districts, was an attorney in private practice, and served in the Pueblo County Attorney's office as an Assistant County Attorney just prior to taking the bench. Judge Haynes received her Bachelor of Arts degree from the University of Northern Colorado in 1985 and her law degree from the University of Denver in 1995. The Commission considered results from the Judicial Performance Survey, interviews with agencies, extensive courtroom observations, reviewed the written opinions, her self-evaluation, and her individual interview with the commission. Regarding the Judicial Performance Survey, all of the groups surveyed had a sufficient response rate. Of attorneys responding to the survey, 11% recommended to retain, 74% recommended not to retain, and 15% made no recommendation. Of non-attorneys responding to the survey, 91% recommended to retain, 4% recommended not to retain, and 5% made no recommendation regarding retention. Pursuant to our Commission rules, Judge Haynes’ survey results fall below the presumptive level for retention. Judge Haynes is polite to jurors, is perceived by the public as fair, and generally imposes consistent sentences. Judge Haynes does regularly reject plea agreements that the attorneys have worked out, and does so without providing support for her decision. This has contributed to a very heavy jury trial schedule, averaging almost one trial per week. Judge Haynes imposes requirements upon the attorneys practicing in front of her that have no basis in rule or law, and she renders inconsistent rulings on legal objections. The commission heard complaints that there are issues with efficiencies in the courtroom, including not starting her docket in a timely manner. Judge Haynes is not willing to work with others in order to resolve issues and has created a hostile environment in her courtroom. Proper mentoring of attorneys is noticeably lacking. The most significant criticism evidenced throughout this process was Judge Haynes’ lack of judicial temperament. She is described as rude, curt, having little compassion, and inappropriately raising her voice at those who appear in her courtroom. These concerns were evident in her May 2013 evaluation survey results, and no improvement is shown in the current survey. Judge Haynes acknowledges the results of both surveys and has only made recent attempts to improve her communication skills, which she believes are the root of the problem. The Commission believes that Judge Haynes fails to fully understand and acknowledge her contribution to the negative survey results and comments, which leaves little reason to expect improvements to occur. Judge Valerie Villanueva Haynes’ Response: I am grateful that over 90% of the public, which includes law enforcement, parties, witnesses and jurors, believe that I am doing my job well. It is my honor to serve the People of Pueblo County. I will continue to foster the courtroom as a place where justice is served and where attorneys may practice effectively. The jobs of judges and attorneys are not easy, but I know that we all strive to do them well. For the public which we all serve, I will continue to expect the highest standards from myself and the attorneys who practice before me.